I realized a few days ago that I haven’t done a muffin post in a while. GASP! Forgive me!? I mean, my blog IS called From Cupcakes To Caviar and what are muffins (in my world anyway) other than cupcakes without the frosting? Because Lord above knows that they aren’t healthy when made by me. I’m the only person alive who can take what should be a wholesome breakfast style food and make it into a caloric mine field, sure to clog your arteries and send you into a sugar coma. I like to think of this ability as one of my finer, more endearing qualities, along with my innate ability to make stuffed animals talk, charm old people with my politeness and toss and turn in bed so much that my husband can’t sleep. Ok, so maybe that last one isn’t so endearing. I have been craving fresh fruit lately and am knee deep into a huge orange phase. I can’t get enough of them. This usually hits me about this time of the Winter. Unfortunately though, about the only fresh fruit WORTH eating are the orange varieties. The rest are all shipped in from places like Mars or Venus, not to mention who in their right mind pays 5 bucks for like 25 blueberries in a carton so small an ant couldn’t make a home in it? So, since I was craving blueberries (in January. Don’t use me as a food role model) and citrus, and knew I needed to make some nice healthy muffins *coughcough*, I combined the ideas, just using frozen berries. But then I totally blew the calorie budget (and I have a really really really really high budget. Call me the Donald Trump of calories.) on a cheesecake filling. But it’s so worth it. 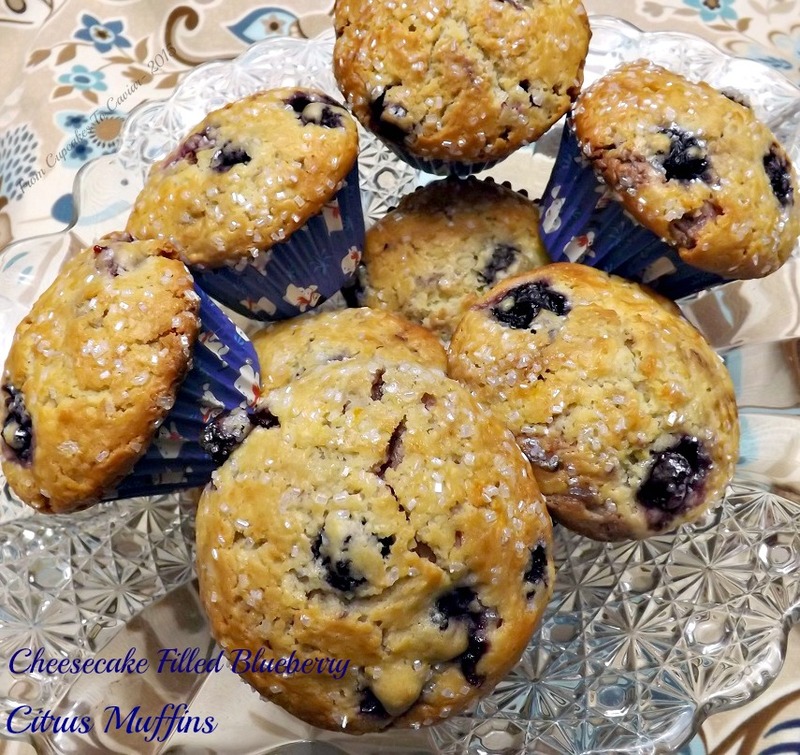 These are moist, tender blueberry muffins, with a lovely citrus edge, then you break one open and there lies a creamy cheesecake-ish filling. You can thank me later. For now, go make muffins. And don’t get involved in playing Monster Busters on facebook and forget your muffins and slightly overcook them. I…ummm… heard of someone who did this once. Yeah, that’s it. Heard of someone. This makes 24 muffins so feel free to cut it in half. I make a lot so that we have some to give away but if that’s not your thing, just make half. Or make them all and freeze half for another time. Line 24 muffin cups with paper or foil liners. Preheat oven to 375 degrees. In a small bowl, combine the cream cheese, blueberry preserves, teaspoon each of orange and lemon zest and flour. Stir well to combine and then set aside. In a large bowl, combine the flour, sugar, baking powder, salt and orange and lemon zests. Whisk to combine. In a large measuring cup, combine the eggs, milk, melted butter and extracts. Stir just until combined; it will still have lumps. Carefully fold in the frozen blueberries. Fill the prepared muffin cups half full. Add a dollop (about 2 teaspoons or so) of the cream cheese mixture on top of the muffin batter. Use the rest of the batter to finish filling the muffin cups to the tops of the cups. Sprinkle with coarse sugar if desired. Bake at 375 degrees for about 25 to 30 minutes, until the tops are a nice golden brown and a toothpick inserted in the center comes out clean. Let cool in the tin for about a minute, then turn out onto a rack to finish cooling. Copyright Notice: From Cupcakes To Caviar images and original content are copyright protected. Please do not publish these materials anywhere without prior permission. This is my second month as a member of “Blogger C.L.U.E.”. I mentioned last month that it’s a fun group that some of my fellow bloggers and myself are doing through Facebook where each month, we recreate a recipe from the blog of one of the other members. Man, that was one heck of a run on sentence! As I was saying, we recreate a recipe from a fellow group member. It’s all done in secret. We get assignments and until the reveal day, we don’t who had our blog nor does the person we got assigned know we have them. This month I got Lea Ann from the blog Cooking On The Ranch . Her blog was new to me and I’ve really enjoyed what I’ve found. She has a good variety of recipes, from ethnic recipes to recipes that scream American to others that she terms as “no recipe required”, but that are so simple that she pretty much just lays out what you need to do with a certain set of ingredients. The theme for this month was “foods your grandmother would have cooked”. Well, I unfortunately didn’t know either of my grandmothers enough to say what they would have cooked, so I twisted the theme a little. I’M a grandma so I did it more as what might be the type of foods my own grandkids could conceivably end up with memories of ME cooking. 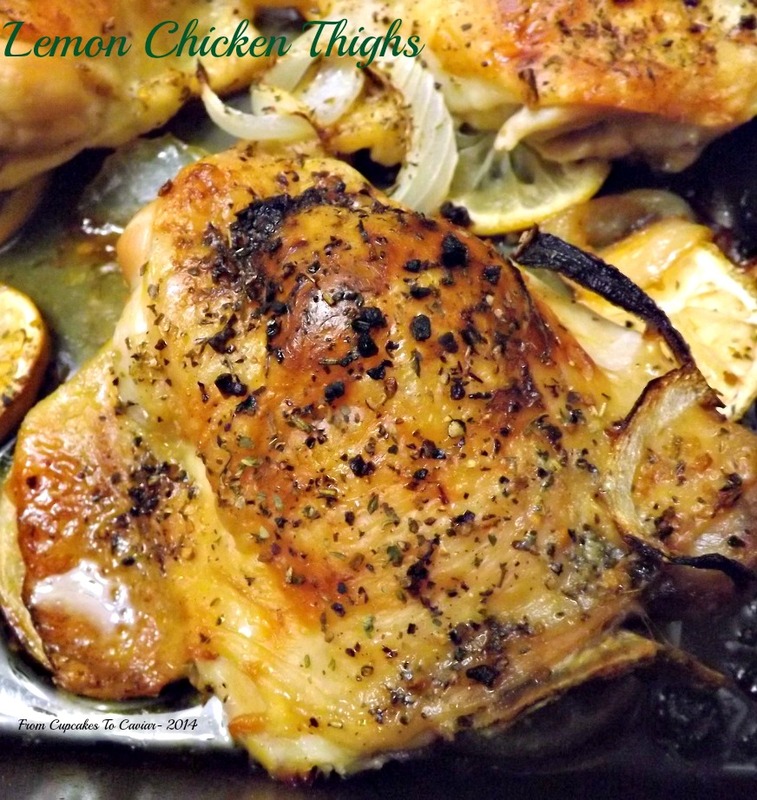 After looking through her whole blog a couple of times, I found myself continually coming back to one titled Lemon Chicken Thighs which came under the “No Recipe Required” category. Was it simple? Extremely so. Did that mean it was boring? On the contrary… this was delicious. Generally, we are supposed to keep the recipes as close to the original as possible and for the most part, I did that. The recipe called just for salt and pepper as well as the lemon slices put underneath the chicken thighs as they roasted. The only thing I did differently was to shove some sliced onion in the pan and add some Tuscan Seasoning to the chicken because the flavors in it (oregano, basil, thyme, etc) go so well with lemony dishes. The onions were just because they smell fabulous when roasting and while they don’t add flavor to the chicken, they add it to the drippings and I love to use those on rice or potatoes 🙂 I also squeezed some lemon juice on top of the chicken to make sure both sides had that lemony flavor. You all know the drill! Get to cooking! This is a wonderful and very easy weeknight “I need to get dinner made quickly” sort of meat. Add some sides and there you go. I’m going to do this the same way Lea Ann did and not post it as an actual recipe, but more just as a process. I know that’s not how I typically do things, but this is so darn easy, it works great that way! Heat your oven to 425 degrees. Thinly slice two lemons (I used three so that I had some lemon to squeeze on top). Overlap them in a baking pan, two or three at a time, then lay a chicken thigh on top of each grouping. Obviously if you are using a lot of chicken, increase the lemon to suffice. Sprinkle with salt and pepper . (I also used some McCormick Tuscan Seasoning on top of my chicken and squeezed some lemon juice on top) Roast at 425 for about 30 minutes or until juices run clear and the skin is all nice and crispy. Aim for an internal temp of about 170 for dark meat. That’s it. Could it be any easier!? I promise, it couldn’t be any tastier! Here are the other bloggers participating in Blogger C.L.U.E. this month. Go check them out and see what deliciousness they all created! Somewhere in there is something from right here on my blog! I thought I would give all of you a break today from the now constant inundation of pumpkin this, salted caramel apple that, maple whatever and bring you something rich and decadent, yet bright and refreshing and anything but heavy. Lemon goes with any season and custard still has a bit of a cold weather feel to it, so this works in all worlds. Plus, it’s so darn good! I remember when my brother, sister and I were kids, we used to make homemade custard. or at least we thought we were making homemade custard. I’m not quite sure what it really was. Steve was the first to try, I believe. And to his youthful credit, it was….edible. If nothing else, it was sweet and as I’ve mentioned before, that was about all that mattered to us as kids. If it had sugar, we ate it. I shudder when I recall us eating *gags a bit* peanut butter sandwiches in which one of the bread slices was heavily coated with sugar when there was no jelly in the house. But the custard…ahh yes, the custard. Overly eggy with strands of scrambled like eggs throughout, usually somewhat weepy and curdled from overcooking and with no real flavor but eggs and sugar. But we ate it. This one is incredibly easy and fairly quick as baked desserts go. You can also eat it while still warm if you want. I personally prefer custard chilled because I love the texture it gets when cold, but the choice is yours. 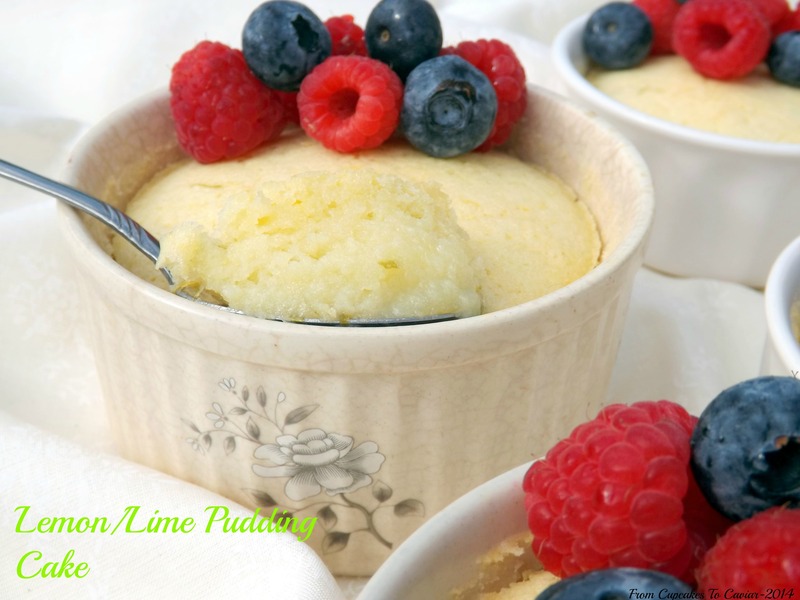 This is rich, creamy and bright with the fresh taste of lemon; a perfect dessert when you want something easy and non chocolate. Warm the cream in the microwave just until warm to the touch, not hot, about 1 minute. Using a mixer on medium speed (you can also just whisk this, but it takes longer), beat together the eggs, egg yolks, sugar, salt and vanilla until it is thick and pale colored, about 3 to 5 minutes. Whisk or beat (low speed) the cream into the egg mixture, beating constantly. Add in the lemon juice and lemon zest and beat well. Divide the mixture between the prepared ramekins. Set the pan on the middle rack of the oven and carefully pour the boiling water into the pan holding the ramekins, making sure not to let it splash into the ramekins. Carefully push the pan in and bake the custard at 300 for about 30 minutes. You want it mostly set but the center third of them should still be a tiny bit jiggly looking. It will set more as it cools. Serve warm (just above room temp) or chill. But while I was sick, I got lots done!!! Ok, while I was sick, the only thing I got done was reading various magazines, playing Farmville on my Kindle 38 hours a day, riding my exercise bike and watching my lungs fall out on the floor and fun stuff like that. Don’t be hatin’. We can’t all have my life…..and my respiratory system. I’m just that special. Back a few weeks ago, before I began practicing death, I had let my facebook followers decide what dessert got made first; a chocolate one or a lemon one. Chocolate won by one vote. ONE…VOTE. Not that I minded. I got chocolate. So now I’m posting the lemon one. Everyone has heard of lemon pudding cake, right? Ok, you in the back… go away. You shouldn’t be on a food blog if you have never heard of pudding cake. What is pudding cake, you ask? It’s heaven on a spoon. Lemon Heaven in this case. Pudding cake is one of the easiest desserts ever. It is a layer of creamy pudding covered by a layer of moist cake. It can be a family treat or is even interesting enough to be served to company. Cover it in berries and slather it in whipped cream and your guests will love you. Did I mention how easy it is? Preheat oven to 350 degrees. Lightly grease 6 6 ounce ramekins. You could also do this in one souffle dish, but make sure to adjust cooking time. In a medium bowl, whisk together the sugar and flour. In another bowl (don’t forget to clean as you go… it makes me happy :-p ), whisk the egg yolks with the softened butter. Whisk in the milk, lemon and lime juices, zest, vanilla extract and lemon oil. Pour the egg yolk mixture into the flour/sugar mix and whisk to combine until smooth. In a scrupulously clean bowl, beat the egg whites at high speed with a hand mixer until stiff peaks form. Fold the egg whites into the other mixture until no white streaks remain. Pour the batter into the prepared ramekins, then transfer the ramekins into a large baking dish. Slide the dish into the oven and carefully pour hot water into the pan (not the ramekins) until it reaches about halfway up the sides of the ramekins. A few weeks ago I was contacted by a rep from Hamilton Beach asking me if I’d like to be a Brand Ambassador for them. Being a long time fan of the company, I immediately said yes. I think I had the email answered before the poor lady on the other end even had time to breathe after sending me the offer hehe. It was rather provident also because my poor hand mixer had finally bitten the dust just the day before. It went up in smoke and stinky fumes. All we needed was flames to complete the perfect kitchen apocalypse. The deal was this- I would receive one of their hand mixers as well as a stand mixer to try out on my own. I was also told that I could offer one of my lovely readers the same deal… both a hand mixer and a stand mixer of your own. Are they awesome and generous or what?! All I had to do was give my honest opinion of the mixers and make a Spring inspired goodie. No pressure to say they were both wonderful unless I felt that way. Well, guess what? I absolutely love them both! Now, I have a stand mixer from that other known company, who shall remain unnamed 😛 and I love it. BUT… it can be a bit bulky and it’s really heavy. Good qualities when I’m making bread or the like. Not so much when all I want to do is make some cookies or whip some cream. The #HamiltonBeach stand mixer has no such issues. I can lift it without getting a hernia lol and it is a workhorse too. The motor isn’t as powerful as the more well known brand but it still does the job just great and is easier to clean being smaller. Plus…. it’s quieter. A DEFINITE advantage in my kid chaotic household. Anything that saves me from noise headaches makes me happy. 😀 This mixer cmes with a dough hook, a paddle attachment and a whisk one, so it’s perfect for just about any job you do. Now to the hand mixer. I really, really, really love it. Did I mention that I really love it? It has what they call “Soft Scrape” beaters that are coated with a pretty bright red rubber coating. This helps them catch the sides of the bowl so you don’t have to scrape it as much when using it. The hand mixer also comes with a whisk attachment and regular non coated beaters if you don’t want to use the Soft Scrape ones. But the Soft Scrape ones are quite handy. The muffins I made for this had a lot of zest and if you’ve ever used a beater for a recipe with zest, you know it ends up getting caught on the beaters and you have to scrape it off, put it back in the bowl and stir it back in. Rather a pain. But none of the zest stuck to the Soft Scrape beaters. It was all in the muffin batter. WooT! Trust me… you want to win this combo! Now onto the muffins. I have a thing for the lemon ginger combo. I use it in tea, baked goods, savory dishes, etc; you name it, I love it. I thought for weeks about what to make for this giveaway and finally settled on this flavor combo. I mean, what better than something I love for a mixer I love, right? And Lemon is definitely a nice Spring sort of a flavor. Citrus always makes me think of warmer weather, even when I use it during the middle of Winter. These muffins are pretty darn good, if I do say so myself. They have a nice tart, but too tart, lemony flavor with a mild bite from the candied ginger and a sweet crunch on top from the sugar. I garnished them with one of my favorite candies ( a gummy candy of course. It’s no secret of my love for gummy candies hehe)… a Lemon Ginger Gummy. You know the drill…… but today add on something to it. Go down to the bottom of the post and enter this giveaway! You could win a Hamilton Beach stand mixer AND a Hamilton Beach hand mixer!! Preheat your oven to 375 degrees. Line 12 muffin cups with paper liners or grease them. In a small bowl, combine the flour, baking soda, salt, lemon zest and candied ginger. Stir to combine. Set aside. In a medium bowl, at low speed on a hand mixer, beat together the butter and sugar until smooth and creamy. Add in the eggs, one at a time, then beat in the extracts, lemon juice and lemon yogurt, at low speed, JUST until combined.. Stir in the flour mixture; again, just until combined. Don’t over mix this. Bake at 375 for about 18 to 22 minutes or until a nice golden brown. 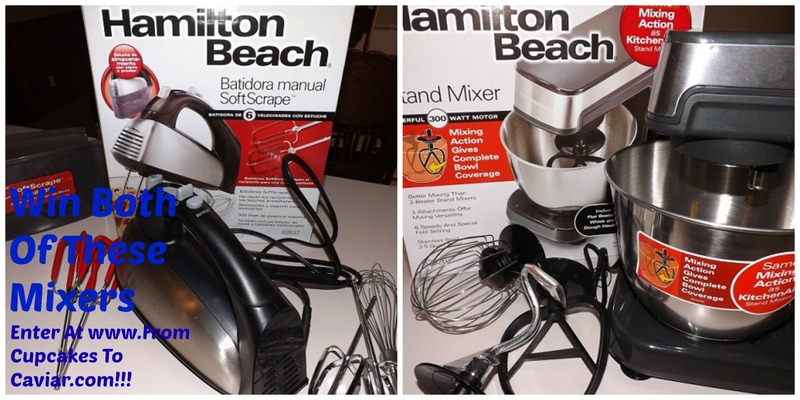 Hamilton Beach Stand Mixer & Hand Mixer Giveaway! Here is the info on what you’ll win if you’re the lucky person picked at random! To enter this contest, a blog comment below is mandatory as well as entering that into the Rafflecopter widget below. In your blog comment, let me know, “What’s The first thing you would make with your new Stand Mixer?”. Then click the button on the Rafflecopter entry below. This will open up a bunch of extra entries to this contest that you can use if you’d like. The only mandatory one is the blog comment, but it’s worth 2 entries apiece for the other methods! (Please note all extra social media entries will be checked for completion if you are chosen as a winner. If they are found to be invalid, a new winner will be notified. (So make sure you actually click and follow or it will be invalid.) Contest is open to U.S. residents 18 years old and older and Hamilton Beach can NOT deliver to P.O. Boxes. You must have a valid U.S. mailing address. I was all prepared for warm weather baking however. Yes, I know that many of you think baking is insane in warmer weather but 1) I’m kind of warped that way and 2) it’s kind of my job… I can’t go on hiatus from April till October 😛 So I still bake… I just change the theme. Pumpkin goes away (well, off the blog anyway. I love it so I still use it here at home), cranberries stay in the freezer and citrus, fresh herbs, and lighter foods (relatively speaking… I’m still me, after all) get made. So I had my mind set on lemon and I’ll be darned if I change it because God didn’t want to watch House or maybe play Rummy with Gabriel. This is one yummy cake. The recipe in it’s original form comes from a Better Homes And Garden magazine I have. 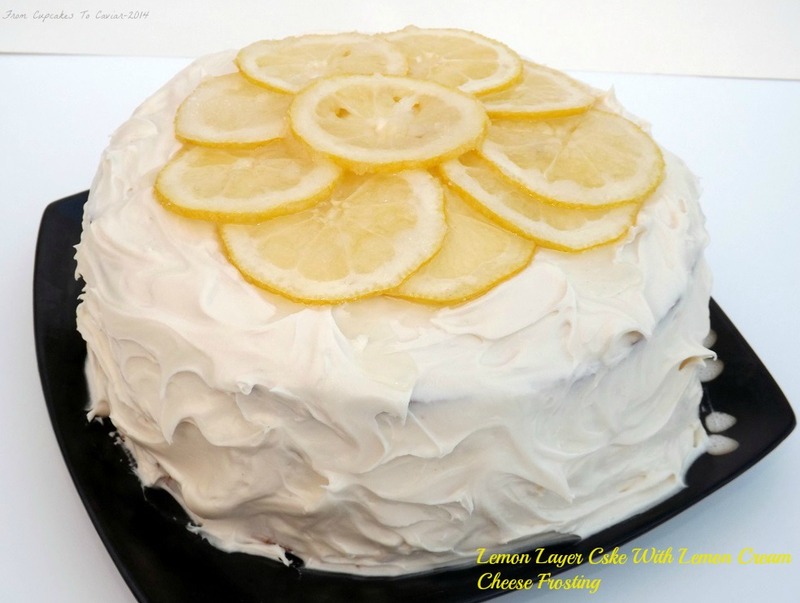 I didn’t change much, just added vanilla, almond and lemon extracts to both the cake and two of those to the frosting, used my own lemon curd recipe (theirs called for a cornstarch custard and to me, that’s just not the same) and didn’t do the caramelized lemons they called for. I just used sugared lemons. Easier, still deliciously edible if one swings that way and did I mention easier? Preheat oven to 350 degrees. Grease and flour 3 9 inch cake pans. Set aside. In a medium bowl, whisk together the flour, baking powder, baking soda and salt. Set aside. In a large bowl, beat the butter until creamy. Add in the sugar, extracts, lemon zest and lemon juice. Beat until well combined. Add in the eggs, one at a time, beating well after each one, scraping the bowl as needed. Alternate adding in the flour and the buttermilk, starting and ending with the flour (flour, buttermilk, flour, buttermilk, flour), beating just until combined after each addition. Divide the batter between the 3 prepared pans. Bake at 350 for 25 to 28 minutes. The tops should be golden brown and spring back when touched. Cool in the pans for ten minutes, then carefully loosen with a butter knife and invert onto a rack to cool completely. While cake cools, make frosting- Combine the cream cheese and butter in a large bowl. Beat well until smooth and creamy, scraping the bowl as needed. Add the extracts and beat until combined. Add in the powdered sugar, a cup at a time (unless you fancy looking like you just drove through a sand storm), beating well after each addition. Add just enough to get a good spreading consistency. When done, stir in the lemon zest. To assemble, lay one cake layer on your serving plate. Spread it with 1/2 cup of the lemon curd. Top with another layer; again spread with 1/2 cup of curd. Carefully place the top layer on, pressing down LIGHTLY to hold them together. Frost the top and sides of the cake with the frosting. For the garnish, JUST before serving (the sugar starts to melt and drip after while, so don’t do it until ready to serve), toss the lemon slices with the sugar until lightly coated. 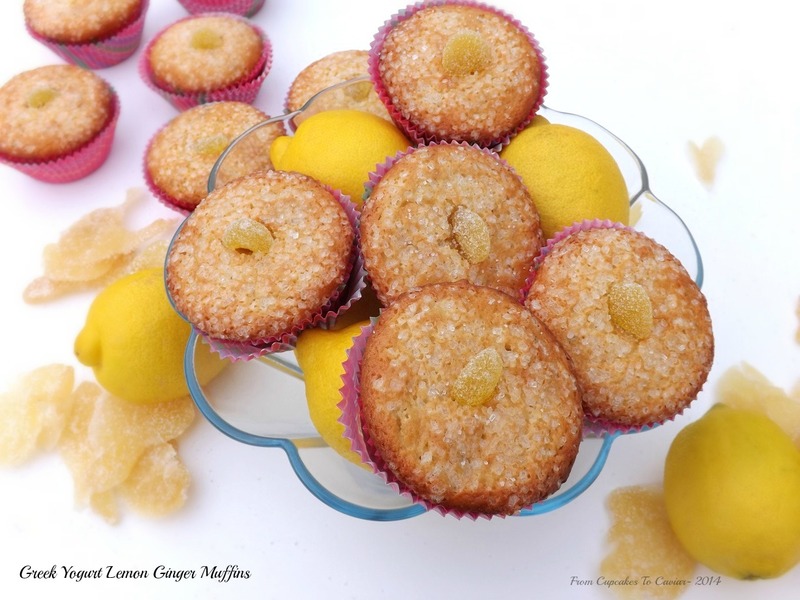 Do a few at a time or the sugar clumps and you get too thick of a coating on the lemon slices. Arrange them on the top of the cake. Serve. There are times when you just need comfort, usually in the form of some sort of food or drink. Whether your idea of that is a bag of chips and a beer and old reruns of Andy Griffith, some chicken & dumplings and a cold glass of milk, sitting under a warm blanket reading Little Women while you sip at some tea or anything involving chocolate, or downing a bottle of Smirnoff, going clubbing dressed in only a thong and high heels and then spending the night over a toilet (which btw, if that’s your form of comfort, I have some numbers you may want to call for help 😛 ) you just have to have some form of comfort. For me, it always involves baking and usually not something new, but something tried and true, something that brings back good memories, which for me would mean when my kids were little. One of the things I baked often then was lemon bars. I mean, who (other than my 17 year old and he’s strange) doesn’t like lemon bars? Well, except for (also) those strange people who just don’t like lemon desserts at all. personally, I think they are aliens come to destroy our world. but I also watched War Of The Worlds last night so I may still be caught up in bad 1950’s movie effects. Lemon Bars have always been one of those quintessential “you need to know how to make these” sort of recipes to me. SO when I realized that after almost 3 years of blogging, I hadn’t yet posted my go to lemon bar recipe, I knew I needed to change that. These are the ones I have been making for about 20 years, though with some changes form the original, which came from (again) one of those monthly Pillsbury cookbooks. You will notice however, the addition of Boyajian Lemon Oil . I have always added either lemon extract (back in the day) or lemon oil (when I realized it was better than extract) but it’s just been in recent months that I have gained an extreme fondness for their specific brand. Give it a try. You can omit the lemon oil but it does definitely add to the overall flavor. Heat oven to 350 degrees. Line a 13×9 inch baking pan with non-stick foil. That is of course optional, but I highly recommend it. In a large bowl, using a hand mixer on low speed, combine all the crust ingredients until mixture is crumbly and holds together when pressed in your hand. if you need to add more water, add a little at a time to get it crumbly and not dry. Press the mixture into the bottom of the prepared pan and then bake at 350 for about 20 minutes or until the crust is a light golden brown. Meanwhile, make your filling- combine the eggs, sugar, lemon zest, vanilla extract, lemon oil, flour and baking powder in a large bowl. Beat on low speed until thoroughly combined. Add in the lemon juice. When the crust is browned, pour the lemon mixture over the warm crust. Return to the oven and bake at 350 for 35 to 45 minutes, or until the filling is firm, lightly browned and set. If you insert a skewer halfway to the center, it should come out just moist, not liquid, rather like a thick lemon curd. It will set up more as it cools. Cool the bars completely before glazing. For the glaze, simply whisk all the glaze ingredients together in a small bowl, then pour over the cooled bars and spread gently. Cut these into small squares or triangles and you can either store them, covered, on the counter for a day or two, or in the fridge for about a week. The fridge is a better bet because they become quite soft and hard to handle when left out. I will now join the club.. I’m ready for Spring to be here. I want to go out and have adult dirt playtime, otherwise known as gardening. I want to see my Hyacinths bloom as well as put in all of my yearly herbs, flower bulbs and seeds. I want to see leaves on our fruit trees and smell the scent of freshly cut grass. I want to hear the crickets and frog serenade me in the evening. But… what I want doesn’t mean squat to mean old Mother Nature. She is a harridan who does things on her own schedule and this Winter, she has been in a really really bad mood. Kentucky (the part I live in at least) has seen more snow and ice than I recall seeing here in over a decade. But compared to what other parts of the country have endured, it’s been a cake walk here. I don’t know anyone at this point who isn’t ready for a little warmth. I feel like an aging cat who wants nothing more than to find the nearest sunbeam and let it soak into my body lol. Spring isn’t going to be here for a while though, even here in the south, so I have to content myself with making foods that make me feel like it is almost here. 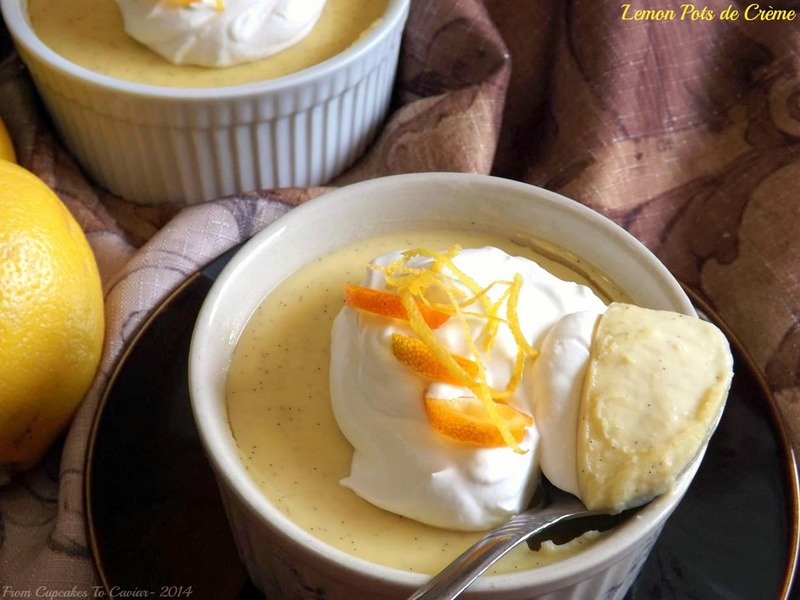 This Lemon Pots de Crème is definitely one of those foods. This is smooth, ultra creamy and rich and intensely tangy; very much a taste of Spring. The recipe is straight from FineCooking.com. The only change I made was to add 1/4 cup of Limoncello to the lemon syrup mixture, but you can always omit that if you don’t want to bother with it. The Mascarpone Cream is also my own touch. I adore having an excuse to make it and use it and it adds so much to a tangy dessert like this one. This is also a touch more involved than some recipes I post, but nothing you can’t handle. Like I’ve said before, just remember to get your ingredients ready beforehand and it makes putting this together a lot quicker and easier. Prep in cooking is SOOOO important. 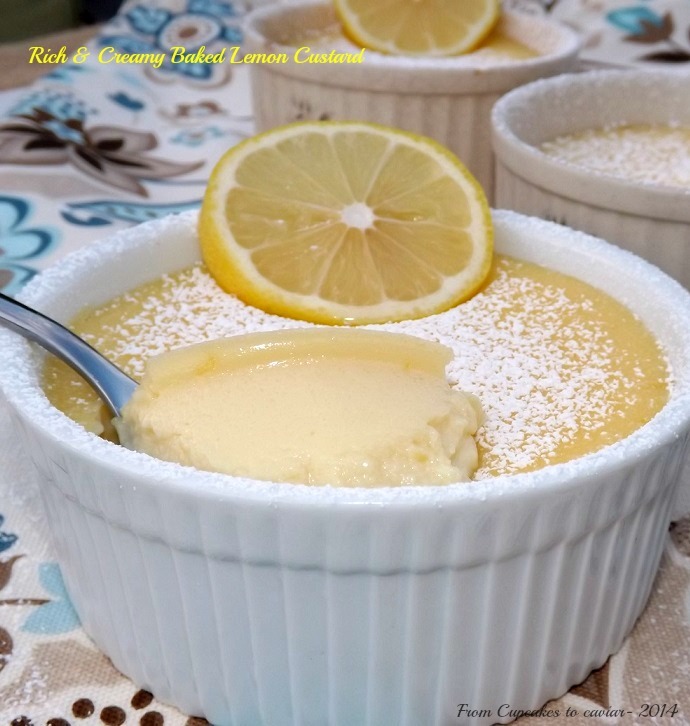 What is a Pots de Crème btw for those of you who may not know? Simply a fancy name for a rich baked pudding/custard. This is egg yolk and cream rich so bakes up very smooth if you don’t overcook it. Preheat your oven to 325 degrees. Place 8 6 ounce ramekins inside a large baking dish. Set aside. In a small pot, combine the lemon zest, lemon juice, 1/4 cup of the sugar and the Limoncello (if using). Simmer the mix until it has reduced down to about 1/2 cup. This will take about 15 minutes. Set aside. In a medium pot, combine the 3 1/2 cups cream, 1/4 cup of the sugar and the vanilla beans and reserved pod (if using extract instead, you’ll add it later) and bring the mixture to just below boiling over medium heat. Remove from the heat and set aside. Gently whisk the egg yolks with the last 1/4 cup of sugar, just until smooth. Don’t make it airy, just smooth. Add a ladleful of the hot cream into the egg yolks, whisking the whole time. Do this one more time to temper your yolks. Whisk the egg yolk mix into the rest of the cream mixture. Cook slowly, stirring constantly (wooden spoons or silicone spatulas work best to make sure you hit all edges of the pot), until the mixture reaches 170 degrees on an instant read thermometer. Stir in the reserved lemon syrup, then strain the mixture through a fine mesh sieve to get rid of the lemon zest and vanilla pod. Add your vanilla extract now if that’s what you’re using. Divide the mixture between the ramekins and carefully transfer the whole baking dish to the 325 degree oven. Gently pour in boiling water, using enough to reach about halfway up the sides of the ramekins. Be careful here, it’s easy to splash it into the puddings and you don’t want to do that. Cover the pan with a large sheet of foil. Don’t tighten it, just lay it over the top. This holds in the steam and also prevents browning. Bake at 325 for 25 to 45 minutes (start checking it at the 25 minute mark), until the Pots de Crèmes are set at just about 1/4 inch in from the edges. You’re not making a firm pudding here; these are looser. If you insert an instant read thermometer in the center, the temp should be between 150 to 155. If so, they’re ready to come out. If you’ve made other baked puddings or custards, you’ll think “no way are these done”. They ARE. They will firm up to the perfect texture as they cool. Take them one at a time out of the baking pan and let cool for about an hour at room temp, then transfer to the fridge to finish chilling and firm up. When ready to serve, combine all the ingredients for the mascarpone cream and beat at high speed until it forms nice creamy semi firm peaks. Garnish the Pots de Crème with lemon zest and the mascarpone cream. I also used some sliced Kumquats because I love them. They’re so darn cute! I’ve mentioned more than once that I was born and raised in Chicago. Right on “Da Sout’ Side” in the neighborhoods you didn’t want to be stuck in alone after dark. I didn’t know enough to be frightened then; it was just home. Today has been dreary as all git out here in Kentucky. No snow unfortunately which would have made it worth it in my eyes, just very gray skies, cold weather and a ton of rain. I keep trying to tell myself that it is good for the trees we recently planted but I’m not convincing myself very well. So I had a baking therapy session. It’s hard to feel blah when surrounded by the scent of fresh lemon zest and then the scent of baking scones. These scones are quite yummy if I do say so myself. They are also huge lol. I think next time I make these I will use a square cut and make about 12 of them rather than the 8 wedges. I used wedges out of habit but these are some big arse scones! But it’s easy to eat a whole one which is another reason to make them smaller hehe. They are just lemony enough; not tart but with that lovely lemon peel flavor. 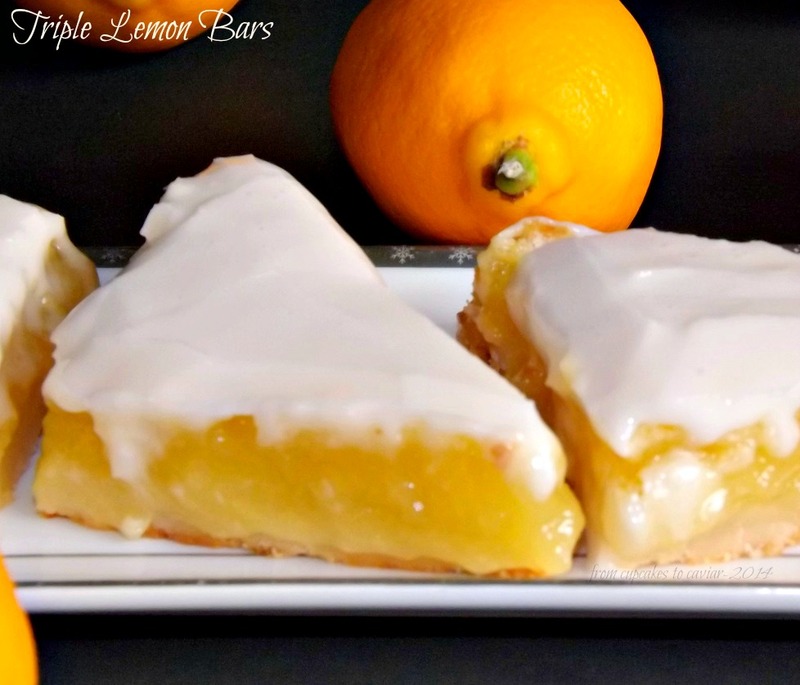 They aren’t overly sweet but the glaze adds a nice touch of sweetness to them and a bit of that tart lemon flavor many of us like. These are simple to make and perfect for Christmas morning breakfast. Nothing can make a Winter day brighter than something citrus. Preheat oven to 375 degrees and lightly grease a cookie sheet. 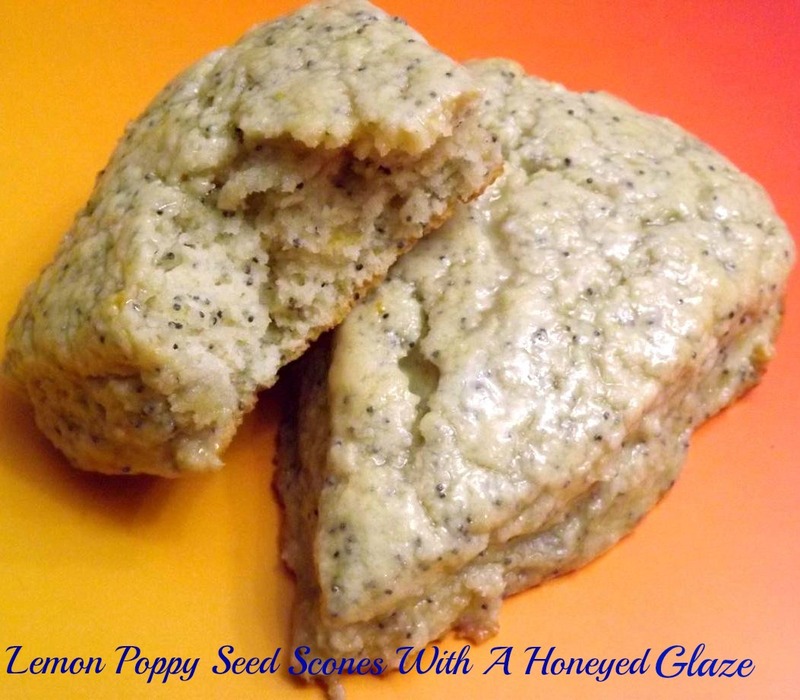 In a large bowl, mix together the flour, sugar, Poppy seeds, baking powder, salt and lemon zest. Make sure to mix well because lemon zest has a tendency to clump. In a medium bowl, combine the egg, cream, lemon juice, lemon oil and extracts. Set aside. Using a pastry blender, cut the butter into the flour mixture until it resembles coarse crumbs. Pour the entire bowl of cream mixture into the flour/butter mix. Use a fork to mix well, until the dough forms a bowl. The dough will be slightly sticky. Don’t be tempted to add more flour. Dump the ball of dough onto a lightly floured counter or board. Pat down into a circle about 3/4 of an inch thick. Cut the circle into 8 wedges and place next to each other, but not touching, on the prepared cookie sheet. Bake at 375 degrees until the tops of the scones are lightly browned (the edges and bottoms will look browner than the tops) and firm. Transfer to a rack to cool. For the glaze, simply mix together the glaze ingredients. Use a pastry brush to brush the glaze over the scones or dip each scone, top side down, into the glaze and let the excess drip off. There are some foods that transcend space, time and all things earthly. Once upon a time, I would have put Twinkies and Ho Ho’s in that category. Yeah yeah, I know. Who the heck puts snack cakes in with transcendental foods? I also put Cheetos, a rare ribeye steak, roasted brussel sprouts and salted caramel gelato in there so am I forgiven? Anyway, Twinkies and Ho Hos lost their spot cause they bite donkey toes now that they have changed over. I was close to being institutionalized when I found this out, but I’ve since moved on. Brachs Gummi Candis and Whole Foods Salted Caramel Brownies have filled the Twinkies void. Sorry, pretend Hostess people. But one food that always seem to fit the whole beyond earthly, etc etc, is a good risotto. I made sure to put the word good in there because I’ve had and made some pretty bad ones. 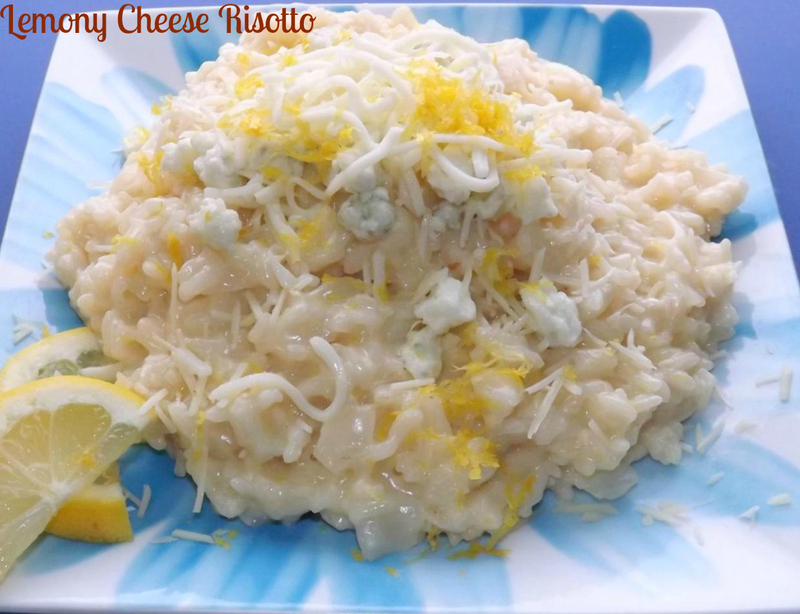 At their worst, they can be gummy, mushy, hard, flavorless and a waste of good Arborio rice. At it’s best however, it’s creamy (with no added cream) full of flavor, a dish that can make the meal shine. This version? it’s the kind that will make you take up meditation just so that you can think about this rice. It will make you see heaven. Honest. It will. Would I lie to you?! Go. Cook. Be free. Make risotto. Thank me later. Cause you really WILL thank me. You can cut this recipe in half, but it reheats well and makes a great lunch with maybe a chicken breast and a salad. In a large sauce pot, combine your olive oil, chopped onions and minced garlic. Cook over low heat until the onions are soft and tender, about ten minutes. Pour in the rice. Stir well and cook for about 2 minutes, until all the rice is well coated. Put the heat on medium and pour in the wine. Cook, stirring constantly, until all the wine is absorbed. Pour the lemon juice into the broth.Add in 1/2 cup of hot broth to the rice. Cook, stirring constantly, until all the broth is absorbed. Add new broth, continuing to stir, 1/2 cup at a time, each time the previous amount is absorbed. When all the broth has been used, add in the Parmesan cheese, lemon zest, bleu cheese and mozzarella cheese. Stir in the butter and stir until it is melted. Use pepper as desired. You can also salt it but I have never seen the need as the Parmesan adds a sufficient salty flavor. Serve garnished with more cheese and lemon zest.